Mabon, also known as Autumnal Equinox, Harvest Home, Witches Thanksgiving, the Wine Harvest, and Alban Elved Mabon takes place on or around September 21st and is the second of the three harvest festivals. 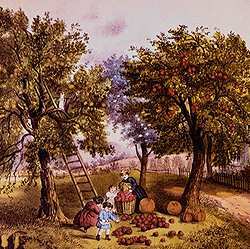 Mabon is typically celebrated through harvesting grapes from the vine and apples from orchard. It is the festival of thanksgiving. This is the time when the sun is directly over the Equator, and day and night are of equal length. The harvest is well under way birds are starting their southward journey, and leaves are in their autumn splendour . Mabon is a holiday with three main themes: celebration, grace, and balance. Although these themes are present every day, now is the time to give them your full attention. This is the time for looking back upon the efforts of the past--not just this year, or the last, but also of your lifetime. Look back on these efforts of yours and your fellows and congratulate yourself on a job well done. Think of those things which you have done that contributed to the community as a whole. Use this knowledge of past effort to plan future contributions. With all of the efforts put forth by yourself, there is always work on someone else's part that allowed you to build upon it. Mabon is an excellent time to give gracious thanks to all the time and energy put forth by others to help you. The work done by others not only helps you by making your work easier, it gives you a base to build higher than you could without it. Take what materials and aid others have given you and use them to further the work you do, which in turn gives others a base to build upon.The Autumnal Equinox is an instant--frozen in time, where our earth is at an equal facing with the sun. From this point on the days will become shorter, the nights longer and colder. It's also-- mystically--a time of magickal balance. Forces of dark and light are trading places once again in their cycle. The light half of the year from the spring equinox (Ostara) until Mabon, is the best time of the year for outward turning magick, that which draws from forces and affect forces which lie outside of yourself. Spells which turn upon inner forces and mostly affect your own self will become more and more important as the dark half of the year grows in power. At Mabon, Witches of many traditions prepare for the season of sleep, the dark time of Fall and Winter. Witches call to the animal spirits for guidance and insight as we enter this time of inner searching. We prepare to meet our true inner self and grow and further our journey toward self enlightenment. We undertake this journey so that when we return to the coming cycle of light, the seasons of Spring and Summer, we can do so in a more peaceful, harmonious and balanced state. Our energies can then touch the community around us and help to promote peace and harmony within it. Use this time of balance, to look closely at the balance in our life. How do you balance your personal needs with your commitments to the outside world? How do you receive and how do you give? You might want to reflect on this in your journal or make it concrete by putting objects on a scale. For everything which represents one side of the scale to you (for instance, a book representing quiet time alone), place something on the other side which represents its opposite (a letter or phone for reaching out to friends). continue to show us the way home. May hugs and smiles continue to warm us. And may the voices of our friends surround us with love.